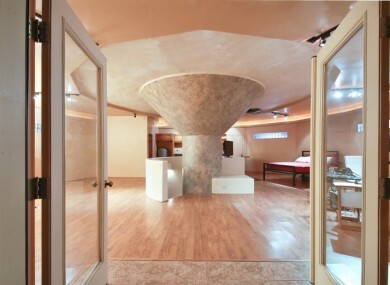 This house comes with a seven-floor underground Cold War missile silo, launch control centre, and private runway. Oh, and it’s also bomb-proof. SURE, CHRISTMAS IS a time for peace, love and goodwill – but just to be on the safe side, how about this bomb-proof house with its very own underground nuclear missile silo? The home looks fairly normal from outside (well, except for the fact that it has its own runway). But underneath it is a 176ft deep “super hardened” Atlas F missile launching silo, protected by blast doors and built to withstand a 200lb/inch blast. It comes with its own Launch Control Centre and sits underneath massive doors weighing 90 tonnes each. The silo is seven floors deep. Some of that has been converted into living space, but the rest is original, rusting cast iron stairways. Sadly, the original missile is not included. The house is on the market for the frankly bargain price of $750,000 from Select Sotheby’s International Realty. Is your bedroom this big? Email “In pictures: House, detached, with nuclear missile silo”. Feedback on “In pictures: House, detached, with nuclear missile silo”.